As part of Fit Bottomed College Week, we’re showing you how to avoid that dreaded Freshman 15! Myths about what college life is really like are pretty prevalent. Partiers expect to be able to skip class and drink to their hearts’ content, thinking the lack of adult supervision means they are free to do as they please. Those who are going to college to work hard and earn a degree expect to pull all-nighters every night, constantly up to their eyeballs in textbooks, essays and homework, swilling Red Bull and Americanos to ever have a shot at finishing. Free time? Psh, yea right. In actuality, it is somewhere in the middle. Yes, you really do have to go to class. No, you don’t get to drink beer all day. And yes, you can handle all the work, if you are disciplined, with enough spare time to make friends, work, have a social life and maybe pick up a hobby or two. If you aren’t careful, however, you could pick up a few other things along with way, including the dreaded Freshman 15. 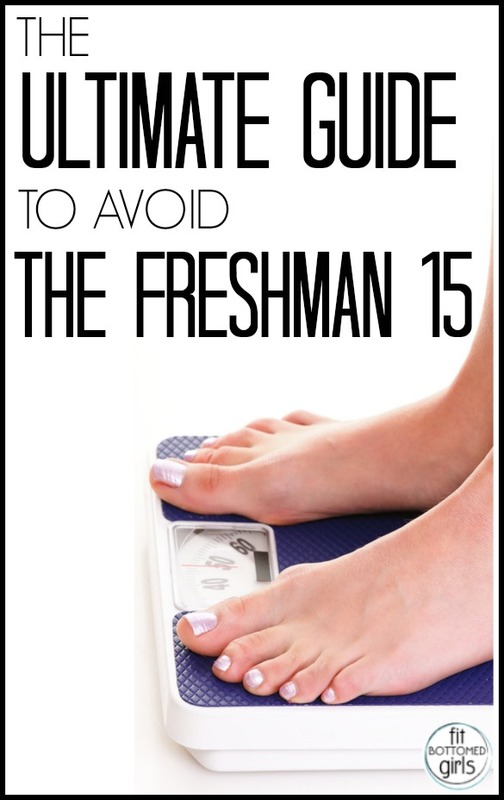 The Freshman 15 refers to the typical 15-pound weight gain freshmen put on while adjusting to their new lives on campus. For many, this is the beginning of putting on weight into adulthood, and if left unchecked, could continue for years to come. Other stereotypical assumptions about college aren’t true, and this one doesn’t need to be either. College can be all poor habits, partying, late-night pizza study sessions, beer, beer, beer, hangover food and Top Ramen, but it doesn’t need to be. You get decide. You are in control of what you do and don’t do. No one will be watching over you to make sure you make the right choices. Surprise! WELCOME TO ADULTHOOD. College is like a training camp to learn how to be an adult, not a timeout from any and all responsibilities like many kids like to think. This is the time to build habits that will shape the type of adult you will be. This includes your health, too. This is not the time to pack on pounds thinking you’ll lose them later because they are that much harder to take off down the road. For many adults, this is where their lifelong battles with being overweight begin: junk food, pizza, beer, soda, poor sleep and exercise habits all wreak havoc on your overall health and metabolism. Great tips! I always used to use the “no gym” excuse, but now ive found online so many different workouts you can do in just a dorm room, plenty of body weight exercises to do too so your resistance training is covered. Setting aside the time is also a big one. If you keep thinking to yourself “oh ill get it done right after this, or this, ect.” it will never get done.